The Bernette London 7 Computerized Sewing Machine is fully computerized with all the latest features most quilters and sewers want. 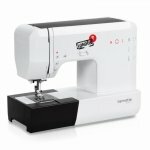 The Bernette London 7 Computerized Sewing Machine includes 60 built in stitches, built in needle threader, top drop in bobbin and more! Flip top lid has stitches printed on them for easy viewing.